After receiving them for review from Badger, I was very pleasantly surprised at the ease of use and quality of these paint sets. For years, I was a Gunze Guy but the supply of Gunze dried up. I transferred to Tamiya and have used it since the Gunze sunset. I had never used Badger paint until I was given the opportunity to review some of Badger's paint contained in some of their color sets. Being an HO scale model railroader, I was very interested in Badger's "RAILROAD ROLLING STOCK #1701," which contains Engine Black, Reefer White, Reefer Gray, Reefer Yellow, Reefer Orange, Dark Tuscan Oxide Red, and Light Tuscan Oxide Red. I am now a fan of this particular set of paints and, in particular, like the Engine Black and Tuscan Oxide Red. Both are easily airbrushed and give that wonderful flat and aged color that I treasure when working on a piece of rolling stock or motive power. 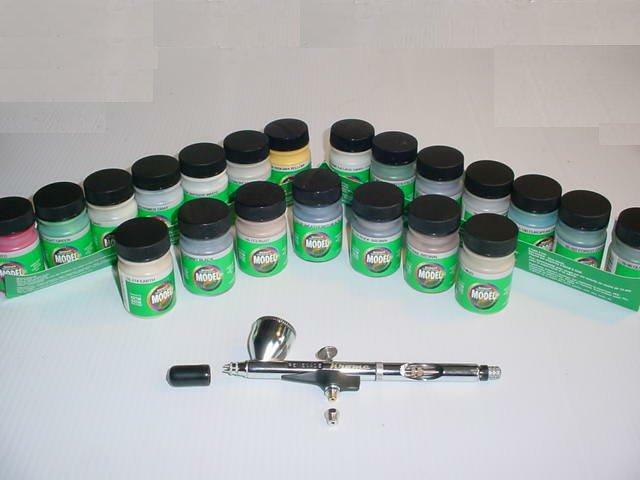 For the auto enthusiast, Badger offers a set of gloss paints in their Automotive Colors Set, # 1705. That set contains Gloss Black, Gloss White, Gloss Red, Gloss Blue, Gloss Brown, Gloss Yellow, and Gloss Green. During a test session, I sprayed a small amount of the Red and a small amount of the Blue on a clean and smooth piece of styrene that had been primed with a WalMart gray primer. Both Badger colors went on the test strip smoothly and without any issues, and both "glossed up" nicely. The surface of the paint dried in what resulted in a smooth, uniform, and glossy finish. For the military builder, Badger offers set # 1704, labeled as "MILITARY COLORS #1704." This set includes Forest Green, Olive Drab, European Dark Green, Armor Sand, Field Drab, Medium Green, and Camouflage Gray. These paints are acrylic paints and are advertised as "airbrush ready." I tested the paint with and without thinning and found that the paint does not need to be thinned straight out of the bottle. Testing procedures included a change in PSI and with three different airbrushes. I used a Paasche single action brush, a Grex, and a new Badger Krome. Of course, the Grex and the Krome laid down differently than the Paasche, but that was due to the fact that the Grex and Krome can shoot very small amounts of paint in a very small area. The important point to note is that the paint behaved as it should in all three brushes and in both types of airbrushes, that being single action and double action. I received the paint samples at a propitious moment, in that I had an Hs-123 underway and was ready to mask and paint it with a 4 color splinter pattern. I was able to use some of the Badger paint along with my usual Tamiya paint on this aircraft project. I found that the Badger paint passed all of the "tests" with no issues. Here are some lessons I learned. Stirred, not shaken..... sorry, Mr. Bond, but the Badger paint behaved better if it was gently stirred rather than given a vigorous shaking. Shaking the paint resulted in a rather frothy "head" that disappeared in a minute or two after opening the bottle. The worst that happened was that this "foam head" got in the way of pouring the paint into the paint cup on the airbrush. Beyond that, it had no effect on the paint or the paint job. Thinner is not better..... Badger advertises that the paint is "airbrush ready," meaning that it is not necessary to thin it, and I agree with this statement. Badger is stronger than masking tape. I found no instance of "paint peel-up" upon removing the masking material as I worked on the model. This is, of course, true of the Tamiya paint that I used side by side with the Badger paint. It should be noted that the model was cleaned with a soapy bath and then dried thoroughly. It can be said that "when the model surface is clean and oil free the paint adheres tightly to the painted surface." By the way, I use blue Painter's Tape rather than tan masking tape. Badger responds better to a slightly higher PSI than that which I am accustomed to. During my testing program I found that increasing the PSI about 3 to 5 lbs higher than that which I used for Tamiya worked best. I do not have any idea as to why this is true, and it could be that I am reading more into the increase in pressure than I should, but the Badger tended to flow out of the brush better at a slightly higher pressure than that which I am accustomed to using with Tamiya. Badger doesn't break. It bounces. Drop a bottle of Badger on the concrete floor and it bounces rather than breaks. I experienced no negative issues using the Badger colors. In fact, the Badger paints responded in the same way to the same airbrushes I used to test it as my Tamiya paint. I found that Badger tends to "froth up" when shaken (so stir it instead!) and that it seemed to work better at a slightly higher pressure. One really nice feature that I uncovered when I accidentally knocked a bottle of Badger on the floor was that it bounced rather than broke! The bottle is plastic! Badger paint is highly recommended for its quality, ability to "cover", and ease of use. Thanks to Badger for providing the paint samples to IPMS/USA, and to the Reviewmaster for supplying it for this review.